The Speech and Debate Team at Grand Canyon University continued its high-flying trajectory last weekend with stunning successes at two California tournaments. The team’s performance at San Diego State and Point Loma Nazarene universities was “arguably the most successful weekend in our team’s history,” said team director Barry Regan, a College of Humanities and Social Sciences instructor. 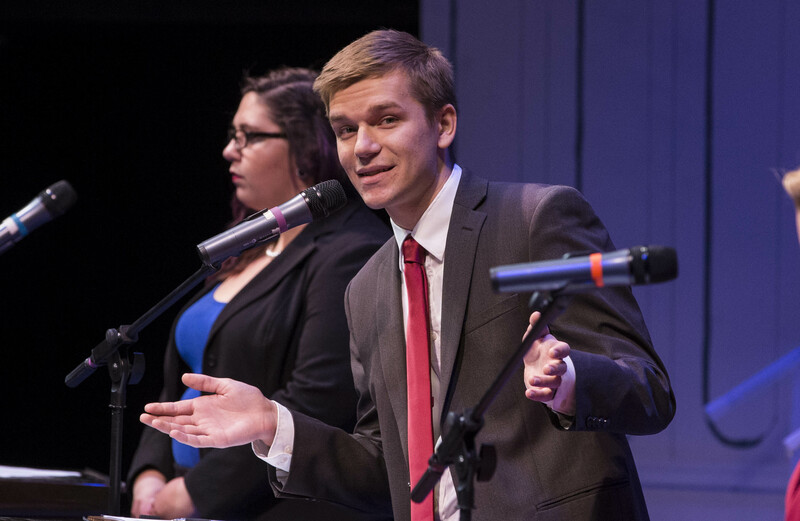 Thomas Rotering (right) nailed his characterizations of Donald Trump in GCU’s mock presidential debate last fall. 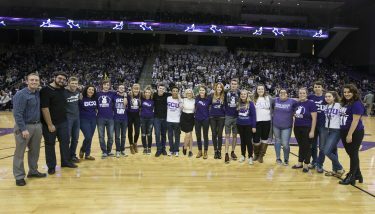 In the San Diego State University contest, GCU took first place out of 17 teams, including several that perennially rank in the Top 10 nationally. Leading the way were senior Zachary Kuykendall (first place), junior Kara Sutton (second), freshman Matthew Calderwood (fourth) and freshman JT Winkler (fifth). At the Point Loma tournament, the parliamentary debate partnership of senior Thomas Rotering and sophomore Jasmin Richardson upset the No. 1-ranked partnership in the country, the University of the Pacific’s Dallas Phillips and Paul Villa, in the “Sweet 16” round, Regan said. On the speech side, sophomore Keliann Nash set a team record with four top-five finishes, in Prose Interpretation, Informative Speaking, Impromptu Speaking and Poetry Interpretation. The Speech and Debate Team was honored at a recent Lopes basketball game. In addition, freshman Grace Laidlaw was first in Extemporaneous Speaking and sophomore Thomas Gleason took first in Persuasive Speaking. Regan said that he and assistant coaches Michael Dvorak, Josh Vannoy, Emma Hong and Jason Hong have been pushing the team to step up and perform at a higher level going into nationals season next month. “I am extremely proud to say that our competitors exceeded even our highest expectations with this all-around team win,” Regan said. The last regular-season tournament is Feb. 26-28 at Hastings (Neb.) College. For the first time, GCU will host the national Christian College Forensics Invitational tournament, scheduled for March 17-19. For a story about Regan receiving a prestigious award for his team leadership, click here. • Kuykendall and Alandzes had a stellar performance at the California State University Long Beach tournament and moved to No. 29 out of 448 ranked partnerships, giving GCU two Top 30 debate pairs for the first time in team history. • At the Mile High Swing invitational at The University of Utah, Rotering and Sharp reached the “Sweet Sixteen,” which placed them 23rd in the nation out of 392 teams. I’m so proud of this debate team, especially since my niece Taylor Alandzes is a member and mentioned in this article. The whole family is very proud of Taylor and we are very happy that she attends this wonderful university. Being an Alumnus of Oklahoma University, I admit that my wish was for her to attend my school. Now I see that her choice was the best for her interests. Continue your hard work and you all will find the success that all of you are aiming toward.